California draft regulations: Self-driving cars must have steering wheel, licensed driver. 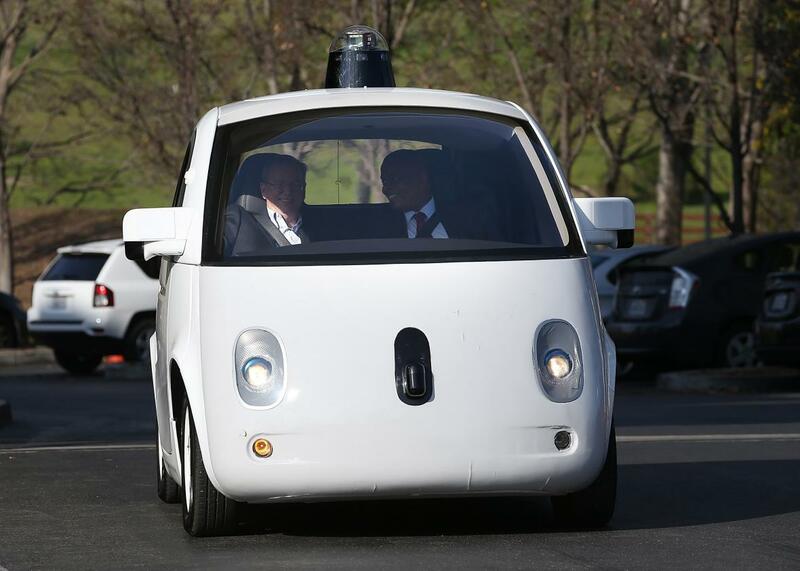 U.S. Transportation Secretary Anthony Foxx (R) and Google Chairman Eric Schmidt (L) in a Google self-driving car on February 2, 2015 in Mountain View, California. On Wednesday, the California Department of Motor Vehicles presented a draft of rules that it will use to oversee consumer use of self-driving cars. Priority one: Vehicles can’t be totally self-driving. The draft calls for a licensed (human) driver and working steering wheel in every autonomous vehicle on the road. The idea is for this regulatory framework to stay in place from current prototype tests through a transition to broader consumer use, since companies like Google and Tesla are promising customer-ready models within a few years. The draft calls for manufacturers to offer customers supplemental training courses that award certificates of completion and are recorded on individuals’ driver’s licenses. “The draft regulations establish financial responsibility, vehicle performance, vehicle equipment, and vehicle registration requirements. Consistent with the testing regulations, commercial vehicles are excluded from deployment. Due to the size of these vehicles, DMV believes that public safety is best served by initially limiting deployment to passenger vehicles,” the department said in a statement. But the companies developing driverless car tech will likely find the draft proposals limiting. Google spokesman Johnny Luu told the Associated Press that the company was “gravely disappointed” with the draft. “Safety is our highest priority and primary motivator as we do this,” he wrote. Google’s prototype autonomous koala-mobiles (above) don’t have steering wheels or brakes, but the design does allow for them. Google also announced Wednesday that it will separate its driverless car division, which will offer rides-for-hire, in 2016 under parent company Alphabet. The California DMV can still adjust the draft rules over the next few months, and, as the AP put it, “the industry is likely to contest them as overly burdensome.” The final version will be influential as states across the country consider preparing for autonomous vehicles. But questions remain about whether it’s really an effective safety measure to put licensed driver’s behind the wheel of autonomous cars.